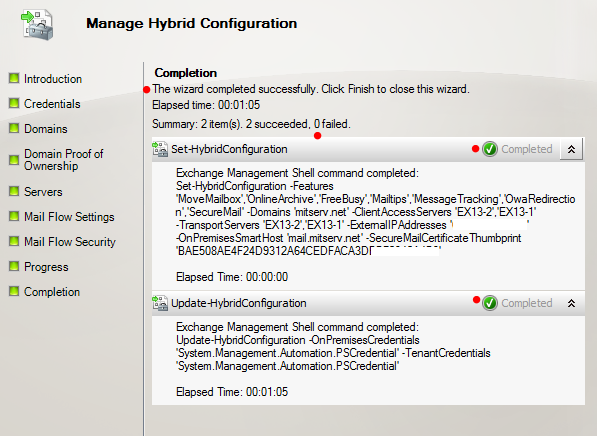 Now that we have prepared ADFS and DirSync (please see my previous blog posts), we can use the "Hybrid Configuration Wizard" (HCW) to allow interaction between our on-premises Exchange server(s) and Exchange Online (the messaging component of Office 365). Note: optionally, we can check "Remember my credentials" so we do not have to enter them each time I open the EMC. We should then see a new icon in the EMC: Office 365. We can explore the various sections at this point, remarking, for example, that there is only one mailbox entry, a "Discovery Search Mailbox". This is normal since we have not yet migrated any mailboxes to Office 365 / Exchange Online. 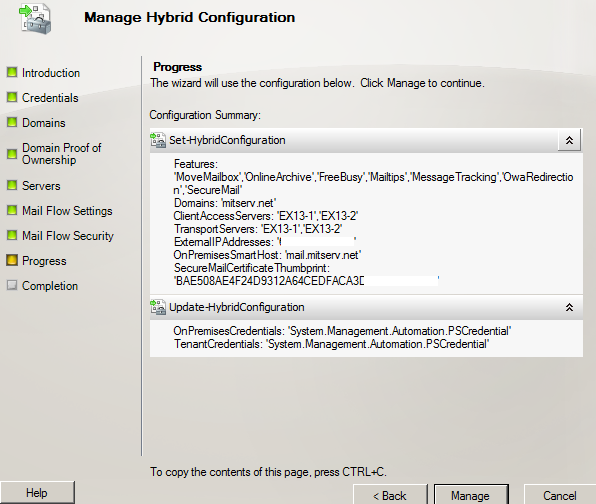 Now that we have added "Office 365" as an additional forest to our EMC, we can execute the HCW. Note: click "New" (not shown in screenshot above). Note: we can optionally check the boxes "Remember my credentials". At this point, the configuration becomes somewhat more complex. Microsoft wants proof that we own the domain that we are adding to the hybrid configuration. In the screenshot below, we see that the HCW creates a value (obscured) that we need to paste into a public DNS text record. We do this with the interface used to manage our external DNS records, most likely the same interface where we manage MX records for the domain name. When I first did this, I was not sure if the value should be confidential or not. In the screenshot above, I show most of it but obscure the last part - just in case. I did not provide step-by-step instructions for the creation of a DNS record in NO-IP since many readers will be using some other system, especially in a production environment using a static IP address. In the NO-IP interface, the text records seem to be listed one above in the other in the same text block. I had an SPF record in first position that I removed because the HCW would not complete successfully with this record present. Once again, however, I will not insist on this point since most readers are probably not using NO-IP to manage their DNS. If in fact you are using NO-IP, you can contact their technical support for any questions. Note: to add your IP address, you would click on "Add" (green plus sign) and then enter it. The FQDN can be entered directly. As for the "Mail Flow Path", I will keep the default selection: mailboxes in Office 365 will send messages directly to external recipients. In the following posts, I'll review some of the changes to onsite Exchange, migrate a mailbox to Exchange Online, access the migrated mailbox and send and receive messages. This document helped tremendously... thank you!